In business, it’s vital to focus on developing a quality LinkedIn profile and avoid making a poor first impression. And the first impression always counts, right? Here are five ways to ensure you don’t embarrass yourself on this fast-growing and powerful platform: the 5 Don’ts of LinkedIn. LinkedIn is not Facebook, Instagram or any typical social network. It’s a place to show your professional side, and that starts with your photo. The first sin of the 5 Don’ts of LinkedIn is the most obvious one: A picture of you slamming beers should better not be there; neither a family reunion. You want a clean, professional headshot with a white or neutral background. If you don’t already have one, hire a professional photographer. If a potential employer looks you up on LinkedIn to find that your profile still says you go to high school although you claim to have years of work experience, you’ve just made a poor first impression. Your profile is a living, real-time résumé that should be updated on a regular basis to reflect the current reality. It should also be consistent with your other public bios — especially the one on your company’s website. Always make sure to note every time you switch companies, earn a new job title or win major recognition. Your passionate opinion about this week’s episode of The Bachelor may be appropriate for Facebook or Twitter, but it has absolutely no place on LinkedIn (unless you happen to be an entertainment journalist). Avoid posting personal or political opinions that could turn off potential employers. That doesn’t mean you shouldn’t be yourself on LinkedIn; just be your professional self. Here’s the rule: If you wouldn’t say it in an office meeting, it definitely doesn’t belong on LinkedIn. The last one of the 5 Don’ts of LinkedIn: Stop neglecting it! LinkedIn isn’t just for job seekers; it’s a nearly limitless network of successfully employed individuals, and it’s a venue where you can establish yourself as a thought leader in your field. Try to post one quote or image every week that reflects your personal and professional values. Regular and relevant quality updates will contribute strongly to your job applications. 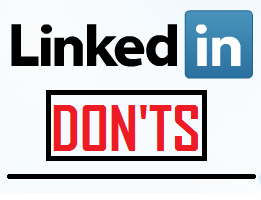 So make sure you avoid these 5 Don’ts of LinkedIn – and leave a professional impression!